AS JOURNALISTS COMMITTED to providing our countrymen the information they need in these exciting but perilous times, do alternative media practitioners still have to abide by the ethical and professional standards to which the dominant media supposedly subscribe? Last week, in preparation for today, I was handed several questions by the AlterMidya secretariat. These questions revolve around the relationship between advocacy and the ethics and standards of media practice. First, what skills does the alternative media practitioner need? The alternative practitioner needs the same skills other practitioners all over the country and indeed the world must have. He or she should be familiar enough with the particularities of the medium he or she has chosen as the vehicle through which he or she provides the media audiences the information, commentary and/or analyses the people need. The differences between working in print, broadcasting whether in TV or radio, as well as working in film and video or online, are clear enough to practitioners. Each medium demands as well a different set of skills, although writing skills are basic requirements in all the media. But aside from these technical skills, the alternative media practitioner must also have the capacity to do the research needed to enable him or her to ask sources intelligent questions, to expose their errors if any and to pierce through their pretensions, as well as to provide the context of events necessary for readers, viewers, or listeners to understand events and issues. Not doing enough research or any research at all, and failing to provide the context of events is a common weakness in the dominant media, which is why they detract rather than add to the people’s understanding of, for example, the roots of the conflict between the National Democratic Front (NDFP) and the neocolonial state, and for that matter, the solutions to the country’s poverty and misdevelopment that the NDFP has been proposing for decades. Implicit in the question on the alternative media practitioner’s function and the standards of journalism are reservations over whether advocacy and professional and ethical standards are at all compatible. My answer is yes, they are – but only for so long as one’s advocacy is in the first place based on factual accuracy. The journalist’s first loyalty is to the facts. That loyalty is implicit in the ethical principle of truth telling and the professional standard of accuracy. Journalism presumes that the truth is discoverable: that it is not a mental construct, but an objective reality that awaits the practitioner’s detection, description and analysis. Unlike Pilate, who asked what the truth is, the true journalist assumes that through rigorous effort, through research, social investigation, and documentary and reliable human sources, he can find the truth and report it. Unlike Pilate also, neither does he wash his hands of involvement in the struggles of his people, and is committed to the truth of our analysis of society and the validity of the national democratic alternative at this stage of Philippine history. This is to say that the alternative media practitioner is not a propagandist as that word has come to mean since Josef Goebbels perverted its meaning, but as a propagandist in the sense of propagating both the truth of that analysis as well as the alternative to it. The alternative media practitioner reconciles this advocacy and the ethics and standards of journalism through his loyalty to the facts, which after all are the bases of his advocacy. Above all are the facts, and if the facts deny the poverty spawned by one of the worst land tenancy systems still extant on this planet, by the economy’s being no more than an appendage of the so-called developed countries, by a society in which a handful have everything while millions have nothing, as maintained and protected by the most vicious and least patriotic ruling class in Asia and its imperialist masters – if the facts should deny these, then the alternative media practitioner must yield to them and abandon his advocacy. Let me say that so far the facts have not contradicted our analysis of Philippine society and the sources of its infirmities, or our alternative to it. Truth telling and accuracy is what journalism is all about, and they are both the basis of our advocacy as well as the continuing responsibility of each one of us. From these, the answer to the next question should be evident: What is the role of alternative media practitioners in the counter culture? Our role is to tell the truth in behalf of change, to arm the people with the power of information and analysis. Our analysis of Philippine society and our proffered alternative to its present state and our commitment to making both known and understood by the people are also what unite us. Finally, what is the point of being ethical and adhering to those standards that journalists all over the world and from different cultures after hundreds of years have established as necessary in the practice of the art and sullen craft of providing information, interpretation and analysis? Without adherence to these standards the journalist is in peril of being ruled by such weaknesses as using journalism as a means of personal aggrandizement, treating the subjects of his reports as other than fellow human beings, and succumbing to the temptation to use the power of the press in behalf of the exploiters and despoilers of their fellow men and the social and natural environments. The journalist who looks at journalism as just a job rather than as a human responsibility is not a journalist but only a technician, or worse. If what he reports is not the truth but lies, of what use is it to anyone? If he or she cannot explain and interpret the world so men and women can liberate themselves by changing the world, and instead succeeds only in further shackling them to lives of ignorance and fear, he is no better than a servant of the exploiters who have made the world what it is. As for the future, in this network lies the promise of a media system that, having contributed to the transformation of Philippine society from neocolonial status to national democracy, shall, through skilled and honest, truthful and compassionate reporting and analysis, help the national democratic state achieve the next stage of human development: to socialism, and beyond that, to that period, perhaps a hundred or two hundred years from now, when classes shall have ceased to exist and the state shall have withered away. 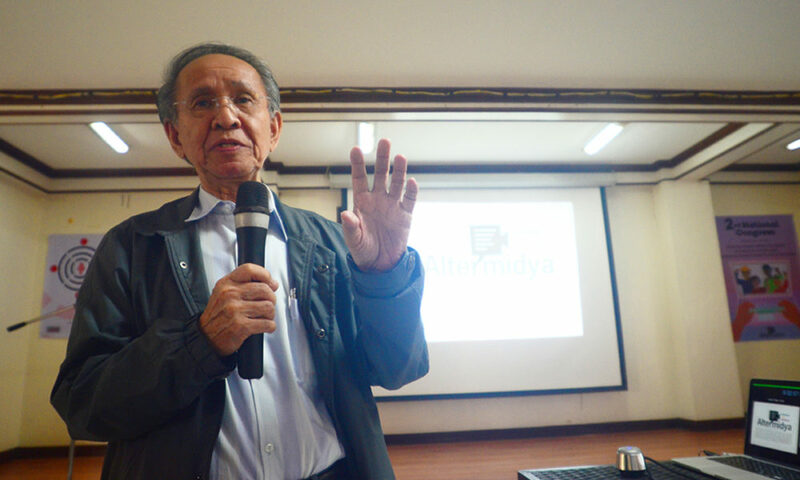 The article is part of the keynote address delivered by Prof. Luis V. Teodoro at the Second National Congress of the AlterMidya – People’s Alternative Media Network on October 12, 2016. Prof. Teodoro is the National Chairperson of the network. Eastern Vista is an alternative media organization in Eastern Visayas. Stories of people in the struggle for justice and aid after super typhoon Yolanda inspired its creation in 2014. Eastern Vista is also a co-producer of Lingganay han Kamatuoran, a Waray-based radio magazine program airing since 2003. From Eastern Philippines, Eastern Vista shares the news and views from a people rising.